The phantasms and spirits that dwell in this mysterious oasis are directly in tune with their environment. Enraged by the toxic spills that poison the purity of their waters, this oasis has generated its own ethereal soap suds and grabs anything even remotely dirty nearby, cleaning it beyond clean! You're not fully clean until your phantasmically fully clean! The Soapy Phantasmic Oasis Skin can be used on Phantasmic Oasis Trap. The trap's stats (power, power bonus, attraction bonus, etc.) are not changed. The Soapy Phantasmic Oasis Skin can be crafted with the proper ingredients. The Soapy Phantasmic Oasis Skin can be traded on the Marketplace or through Give To Friends. 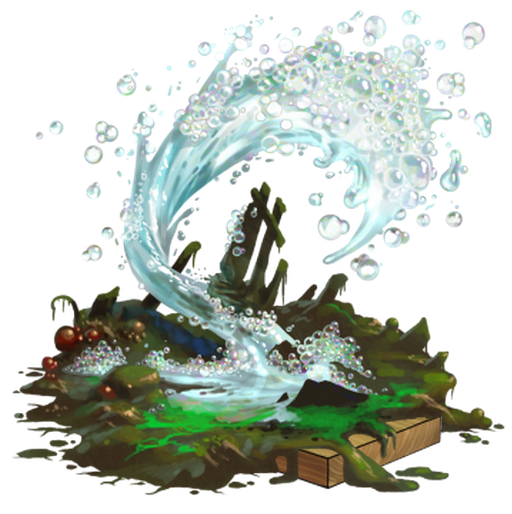 21 January 2014: The Soapy Phantasmic Oasis Skin was introduced with the release of the Toxic Spill content. It was one of the first skins that could be crafted. This page was last edited on 9 December 2017, at 15:02.